Chosen to provide post-tensioning design, materials and execution, CCL supplied its XF Bonded PT System. One of the features of the tower was an inclined column. In order to ensure the accommodation of the additional forces which would be introduced, CCL carried out a comprehensive review of the design requirements at an early stage. The structure also included a large number of internal shear walls which the contractor wanted to construct at the same time as the core walls using a slip-forming system. Because the PT tendons had to pass through, perpendicular to the shear walls, CCL located and fixed sections of the post-tensioning ducts within the walls prior to casting. After the walls were cast and the PT slab layout could begin, CCL installed the remaining ducts to allow the strand to be fed through them. This technique allowed the core and shear walls to be constructed simultaneously, cutting the intervals between work cycles and overall works duration, which resulted in a reduction in the final project cost. 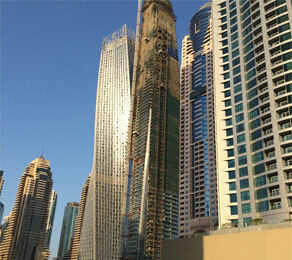 CCL fulfilled its commission by completing the post-tensioning works on all floors up to and inclusive of level 84.